Disclaimer - The information in this article is offered in good faith, without warranty. Although the compiling has been done with due care it is not possible to warranty the accuracy of all the data. It is meant to be used with a fair degree of common sense and logic. Neither the author Michel H. Porcher, nor any publisher of this article will have any liability whatsoever to any person or organisation in respect to any alleged loss, damage or liability incurred from the use of the information presented. Opinions expressed on this page are the author's own and do not represent the views of the Institute of Land & Food Resources, The University of Melbourne or their respective staff. 'Elsa', showing fresh seeds (left) and dried seeds (right). This is a type of bean of the species Phaseolus vulgaris which was originally developed in France in the 1800s under the varietal name of "NAIN HÂTIF DE LAON" , meaning 'Laon Early Dwarf'. Many dwarf cultivars (cultivated varieties) belonging to this species are known and were formally known in France under the trade name of "flageolets".. Some have white seeds (Flageolet blanc or White Flageolet), some have black seeds (Flageolet noir or Black seeded Flageolet), some have red ones (Flageolet rouge or "Red Kidney"), and some have yellow seeds (Flageolet jaune or Yellow seeded Flageolet). The outstanding group which is the object of this little insight however has green seeds. To be very exact it is basically a white-seeded type but with the ability to retain chlorophyl much longer than other beans in specific conditions (French technical expression: "grain blanc à cotylédons chlorophylliens"). It is known as Flageolet vert or Green Flageolet. It was first obtained by a French grower called Gabriel Chevrier, in Brétigny-sur-Orge, a suburb of Paris, between 1872 and 1878. 1878 is mostly quoted as the official birth of the 'Chevrier' because it was first commercialised in that year. This dear fellow grower gave his name to the traditional cultivar now heirloom: haricot flageolet "CHEVRIER VERT". This variety was to become very famous in the top restaurants of Paris and later (a few years later) in all French households as in those days the French had a palate unspoiled by artificial food and from the uneducated paysan to the most pompous upper class gourmet they were all able to recognise something good when they tried it for the first time...and they usually were not content with trying it only once...if it felt good or tasted good it became part of life. Today however the Flageolet bean "CHEVRIER VERT", is an endangered heirloom, including in its birth place : France, where, along with many other thousands of traditional varieties of vegetables, its production is officially "en regression". The main reason is that the natural plant is prostrate rather than erect. This leads to pods getting in contact with the soil and being infected with various diseases such as anthracnose... and of course it is difficult to mechanically harvest such bean plants. Only less than a handful of companies in the world still carry the 'Chevrier' in stock, 1 or 2 in France and 1 or 2 in U.S.A. From the original, many modern varieties have been developed which are today protected under P.V.R., P.V.P., U.P.O.V. etc. and as such cannot be legally reproduced commercially. They are still open pollinated varieties but some resistance has been bred into them. Anthracnose is one of the deadly diseases that they are all resistant to. Some are also resistant to some viruses, some to the Mosaic virus etc. Certainly the intensity of the seeds' green varies from cultivar to cultivar, so do the size and shape of the seeds and the number of seeds per pod (this characteristic seems rather unstable). The taste appears to be rather stable among all the different cultivars according to all the chefs who had tasted several varieties and we talked to. The modern cultivars seem to have found a new life around the world at the dawn of this new century. In France alone for example, according to the National Institute of Agronomic Research (INRA) the production of flageolets has steadily increased from 31.049 tons in 2000 to 36.332 tons in 2002. We have gone into an amazing amount of trouble in order to unearth the many modern cultivar names (see list at the end of this article). Some of those would have disappeared already, some new ones appeared and some old ones reappeared under a new name. This is of course partly due to the turmoils in the seed industry worldwide. Undisputedly this is a proudly recorded detailed history qualifying the bean as a true "heirloom" or "heritage" variety as shown in the web page associated with the town of Brétigny-sur-Orge, Canton d'Arpajon (Essonne) - France, dedicated to Gabriel Chevrier with portrait of the dear fellow and archives displaying his prestigious awards. To top the lot the Flageolet has recently been submitted for entry into the "Label Rouge" reminiscent of the "Appellation d'Origine Contrôlée" applied to French wines, presumably and justifyingly to protect against the growing competitive production in foreign countries of often inferior quality. Main features - What has the "Flageolet vert" got that other beans haven't ? Its most remarkable feature is its seed, smaller than other kidney-bean seeds, and of an attractive pale green colour, a fairly rare trait within the Phaseolus vulgaris species. However treat the flageolet as any other bean in the field and you will have a very ordinary-looking white-seeded low-yielding bean. The "magic touch" of the growers has to do with the picking and the drying process. Many claim that it has a delicate flavour found in none other Phaseolus but perhaps reminiscent of green soybean (Asian opinion) or Lima bean (American opinion), no doubt this is influenced by the "cute look" of the seeds reinforced by the prestige attached to the origin of this ingredient - if it pleases the Parisien gourmets' palate it has to be EXCELLENT. The seed is at its very peak for colour and flavour in its fresh or semi-dry state, as shown on photo above (something that can hardly be gathered from tinned seeds). It then needs very little cooking and just melts in the mouth. It does not require presoaking or precooking and would be easily digested by most people because at that stage it has not developed many of the anti enzymes normally making beans difficult to digest. The seeds skin being thinner than in other Phaseolus vulgaris cultivars also facilitates digestion. In traditional French cooking the flageolet is most famous as an accompaniment to a roasted leg of lamb but it certainly is not its only possible use. On the contrary its attractive appearance allows it to blend in any sophisticated colourful vegetarian presentation. 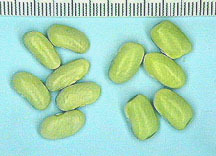 In order to obtain fresh seeds the pods have to be harvested when well filled but still green. Only a few varieties of Phaseolus can be easily shelled at that point. They fall into the generic name of "horticultural beans" or "shelling beans" in America, are known as green-shell-beans. The Italian Borlotti (light & dark brown seed) and Cannellini (white seed) are probably the best known of this type around the world. To obtain semi-dried seeds the whole plant can be pulled up and hanged upside down in a shed to dry ( this will limit infection by diseases such as Anthracnose which could spoil a number of seeds on non resistant varieties ), and the pods picked when a dull green and feeling dry to the touch. If the plants are left in the ground the pod colour may be closer to gray rather than green and the harvest period for this specific purpose slightly reduced. Any seed past the semi-dry stage can be consumed dried so nothing is lost... except the colour and freshness. Moreover in good growing conditions seeds can be produced (subject to local PVR laws) and stored for sowing in ensuing years. The flageolet can also be consumed at the "green bean" stage, like some other "horticultural beans" although this is of short duration because the pod is not stringless (well! there may be one or two stringless cultivars). In case of an excessive production the shelled fresh seeds can be frozen like peas, preferably after a short period of blanching. The unshelled beans can also be frozen if time is short and all pods cannot be shelled at once. Although I have never tried that myself, I imagine that once defrosted the pods would be very easy to shell. If that was the case it is a technique that restaurants could use to allow them to buy their "year supply of fresh seeds" and they would have a product not quite as good as a non processed fresh seed but certainly better than the tinned stuff. Given the extreme difficulties encountered by restaurants in insuring a regular supply in Australia, it is perhaps an idea worth exploring. MORE RECENT (AUSTRALIAN) HISTORY - How and where to get seeds of the Green Flageolet. In 1989 I wrote " ... this variety is not grown commercially in Australia due mainly to the fact that it is low yielding and requires a little extra attention for the production of top quality edible fresh seeds. I would be surprised however if no gardener at all was growing green flageolet. So far the Seed Savers Network has not located anyone but it is only a matter of time. Interested growers however will have the opportunity to test the first cultivar ever introduced into Australia. " In 2000 we can safely say that the green flageolet was indeed in Australia and is here to stay. It is now on the stock list of both the Seed Savers Network and the Heritage Seed Curators Australia. Several small companies sell the seeds of some cultivars occasionally, in small quantities to gardeners. I try to maintain 4 cultivars myself, 2 of which I got (legally) imported from Idaho, USA,  for commercial production, and 2 of which were handed out to me by anonymous gardeners at field days (I hereby still call of those elderly gardeners to contact me). These were most likely illegally imported many years ago, like so many valuable old cultivars of most vegetables. I have now propagated each variety for my own use for a number of years to make sure that they were not carrying any disease and am fairly confident that we have clean seeds. Generally bean seeds (together with lettuces and corn) are prohibited imports in Australia for the very good reason that there are more than 97 different diseases (25 of which can be transmitted by infected seeds) afflicting them overseas whilst here in Australia we only have around 37 (of which 18 are seed borne). When importing seeds legally permits are only given when the overseas source is in a reasonably disease free zone and it would appear that there are more of those in the U.S.A. than in France. In addition, on landing, the authorities carry out some tests or treatments before clearing the samples for distribution. This ensures that the risks of infection are minimised. It explains also why the process is so expensive. Perhaps in the future it will be possible to put genetic engineering to good use for a change and that it will be possible to get disease free material from anywhere in the world...that is if the lawyers and politicians do not interfere. Let's hope also that if this eventuates, by the time it does, there will be enough material left in the world worth importing. Should one purchase "treated" seeds or natural seeds? Most commercially available seeds have been covered with a chemical dust which gives them a pink or blue look. The main advantage of those chemicals is that they increase the germination rate by protecting the seeds, from microbes, when the sowing occurs too early, in too cold a soil. If quality, organically grown, untreated, seeds are available they should obviously be given the priority. If they are sown on time they will perform as well or better than any treated seed (which would have a tendency to be older). Seeds distributed for the purpose of sowing should never be eaten or fed to animals, whether they look green, pink, blue or have a natural colour. TECHNICAL NOTES (previously published as "ID card of Flageolet bean" by Michel H. Porcher 1989, Revised 1998). The following supersedes all earlier publications. English common name (s): Flageolet bean, Green seeded Flageolet, Green Flageolet. Cultivars: see tables and photographs. Vegetative cycle: Annual, day neutral. Height: 25 to 38 cm (10 to 15 inches). Spread: 10 to 20 cm, occasionally to 30 cm (4 to 8 inches, 12 " on occasions). Root depth: Most of the root system is confined between 2 and 5 cm, some of the roots reaching 1 m deep in ideal conditions (5 to 7.5 inches, down to 25"). Number of seeds per weight: see tables. Seed longevity: 3 years to 5 years in good dry and cool conditions. Harvest / sowing ratio: 25 to 40 (ie. 2 kg of seeds sown, 50 to 80 kg of seeds harvested). Preferred soil type: Well drained loam rich in humus. Preferred soil pH: 6.5 (5.8 to 6.7). Temperature requirements (from different references for various purposes). 28deg.C (60deg.F to 85deg.F) for best results in practice. Soil for growth: Range 21deg.C to 26.5deg.C (70deg.F to 80deg.F). Air, during the day: 15deg.C to 26deg.C (60deg.F to 80deg.F). Air, at night: Not that significant as long as it is above 10deg.C, preferably above 15deg.C. Feeding requirements: Rock dust / compost application in early spring if necessary. Compost applied on surface, under mulch, after hilling up. Foliar feeding once every two weeks, in early morning. A sprinkling of wood ashes on the surface after sowing is preferable to liming. Rock dust can also be applied then, if it was not previously. Rate of application: Less than 300 kg per 100m2 per year. Irrigation requirements: Soil must be moist enough during the first 2 weeks, during pollination and pod swelling. Irrigate then if necessary (1 inch per week). Cultural particulars: Hill up plants as soon as they are large enough (optional wires on either side of row for later support). Mulching reduce weeds and the incidence of anthracnose because pods and soil are not in contact. Hilling up and weeding should be limited to the early stage of growth so as not to damage surface rootlets. Weed control: Mulching under plants, shallow cultivation between rows. "Sea Minerals" sprays or flame control could be tried on a small patch. Cucumbers, corn or pumpkins when associated with beans do a good weed control but on the other hand could be a problem depending on the overall techniques used. Companion plants: Corn, pumpkin, lettuces, Celery, Cucumber. Rotations: Should follow a light or heavy feeder but not an other legume. Should precede a heavy feeder, preferably a leafy one. Should not be grown more than once every 5 years (7 preferably) in anthracnose infected soils. Preceding crops: Root crops or other light feeders or non leguminous green manures. Following crops: Leafy crops such as green mustard or grain crops such as wheat. Major diseases : Anthracnose, Mosaic virus, other viruses, Black root, Botrytis, Summer death. Most efficient disease control: Using disease free seeds (roguing plants showing any symptom of disease may help towards achieving this when producing seeds for sowing) and rotations. First trial precautions : It is good practice to inspect samples before sowing any bean cultivar for the first time by spreading all the seeds on a dry, clean, surface of a contrasting colour. Any seed looking off colour or beige or brown (in the case of Flageolets) or broken should be discarded and preferably burnt. This limits the chances of sowing seeds that have no chance of success, it saves space and may even help in the prevention of diseases. This technique combined with the roguing of sick looking seedlings later on should ensure that the final produce is of top quality. Sowing in line facilitate this later trick greatly. The most deadly diseases are the viruses (not yet in Australia) so removing and burning any plant with mottled leaves will reduce the risk of spreading any such disease, whether the coloration is due to the mosaic virus or nutritional deficiencies. Sowing rate: 100 seeds per 10 m row. Sowing tips : Either sow seeds in line, 3 to 4 cm between seeds, 40 cm between rows or in groups of 3 to 6 seeds spaced 30 to 40 cm apart. The first method suits best seed production as it facilitates roguing, the second technique is best suited to cropping but will not suite mechanical sowing. Sowing location: Outdoor only, in the open or under clear plastic film which will be removed later. Sowing period: Once soil is warm enough. This is essential for a quick start, free of disease and pest problem. 2 weeks after last frost to 4 months before the first expected one (based on averages) is a good guide. Spacing successive sowings every 2 to 3 weeks is especially useful for extending the picking period of fresh seeds. Sowing depth: 2 to 3 cm in sandy soil, 1 to 1.5 inches in heavy soil. Sowing to germination: 4 to 10 days. Sowing to harvest: 52 to 120 days depending on cultivar and whether the seeds are harvested fresh or dried. Average germination rate: 85% after 3 year storage. Previous year seeds kept in good conditions can have a 98% success rate. - Fresh seed production : pick pods from the plants when seeds are fully formed, as one would for peas, and most pods are still "relatively difficult" to open (although part of the suitability to green-shelling of some cultivars / types such as the Flageolet is that they are easy to shell). - Semi-fresh (demi-sec) seed production : pull up whole plants when about 80% of pods carry plump seeds and hang in a well ventilated shed away from light. Pick pods as soon as convenient. Pods are then easily opened. Pods containing semi-dried seeds can also be picked directly from the bushes outside but they cannot wait then or the seeds may loose their green colour. An other advantage of lifting the whole plants is that it liberates the ground for other crops. For seed stock the plants should be picked when the pods have begun to dry and change colour. Do not pick from the plants outside during wet weather or when plants are wet for water can carry diseases from plant to plant via the hands of the picker. Although it would be a waste to pick the pods when young (at the snap stage) if such was the intention of the grower, picking would need to be carried out at least every two days. Selection: Varieties of Phaseolus vulgaris must be spaced at least 30 m apart with a tall barrier in between. The pods should preferably mature on the plants in place and the seeds should be collected only from non-diseased specimens. Seeds with anthracnose symptoms (spots) should never be sown when intending to grow seed stock ie re-sowing. Average seed yield: Vary with cultivars from 10 to 15 kg of dried seeds per 100 m row, 16 to 50 pods per plant, 2 to 8 seeds per pod. Culinary notes: Cook fresh seeds, in very little water, on low heat, a short time. Stored dried seeds are cooked like other dried beans. After overnight soaking or a precooking the beans are then placed in 2 to 3 times their volume of fresh cold water, brought to boiling point and cooked on low heat until tender. Recently harvested dried seeds can be treated like fresh seeds simply cooked a little longer. Adding salt to cooking water toughen the beans and they take longer to cook. A small spot-survey on the availability of cultivars of Flageolet in the world in 1989 and their sources  . We have not discriminated between N.G.O., retail and wholesale outlets. A table of modern cultivar names follows. "Chelinex": (Developed by France-Graines), P.V.R. protected, resistant to anthracnose & mosaic, 7 to 8 seeds per pod, Vilmorin, Seed Savers Exchange U.S.A. No longer commercially available in U.S.A. (since 1988). "Cheverbel": 55 days, 15'', Thompson & Morgan. Members of S.S.E. "Chevrier Vert": 95 days, 24'' high, 6 to 7 seeds per pod, resistant to black root, The Cook, Herb, Sluis, Le Jardin, Catros, Members of S.S.E. "Chevrinor": (Bears pods high of the ground), Resistant to anthracnose & virus 1, Truffaut. "Flagrano" 76 - 80 days, Johnny's Selected Seeds. "Flamingo": 90 days, resistant to anthracnose, mosaic & halo blight, Sluis. "Flaresca": 92 days, small seeds and small pods but very high yield, resistant to anthracnose & mosaic, Sluis. "Flax": 100 days based on limited trials in Victoria, Australia. More trials, observations and note taking are needed. "Vernel": (Developed by Vilmorin), P.V.R. protected, resistant to anthracnose & mosaic, 5 to 6 seeds per pod, Vilmorin. Un-named cultivar: 90 days, 5 to 6 seeds per pod, Hastings, Nichols. 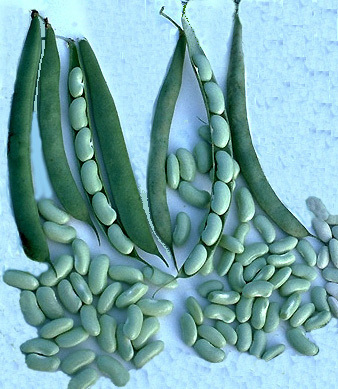 Cultivars of Flageolet vert available in Australia (2000). "Flax": Has been widely distributed in Australia in the last few years since I got it imported  and launched the distribution in the early 1990's and was grown for the gourmet market for a few years. Low quantities of seeds available from either The Seed Savers' Network or the Heritage Seed Curators Australia , [Photo of seeds]. "Flagares" : I have grown this cultivar for two years now. It was imported  and grown (1998 - 2000) in Australia on a commercial scale for the production of the gourmet market. Low quantities of seeds available from either The Seed Savers' Network or the Heritage Seed Curators Australia . "Elsa" and "Chevrier" were also discovered in Australia but to my knowledge have never been grown commercially due to a lack of quantity of seeds and the fear that the available seeds may carry a disease. Low quantities of seeds available from either The Seed Savers' Network or the Heritage Seed Curators Australia , [Photos of seeds]. The following are all green-seeded and have been through a registration process so some credibility can be given to their cultivar names. The source of this information (INRA - France) however was not able to supply many details. We have given the names of the companies involved in the production of those cultivars as well as the dates they were introduced into the market. It is interesting to compare these official names with the trade names encountered in various catalogues around the world. Reference for this table : INRA , 2000 - 2002 , Base Haricot. Institut National de la Recherche Agronomique. < http://www.inra.fr/Internet/Produits/legumineuses/haricot/haricot.htm >. * 'Chevrier Mangetout Sans Fil' is a stringless bean. We assume it is also green-seeded. * 'Flambeau' is described as a "filet of the type ' Triomphe de Farcy ' " by INRA. It is found in foreign catalogues as a green-seeded flageolet. "A Feuille d'Ortie " Awaiting feedback (not sure if green-seeded). 'Chevrier Vert': Graines Loras , Graines Baumaux, Suffolk Herbs, Members of S.S.E. "d'Étampes " Awaiting feedback (not sure if green-seeded). 'Flaforte' Graines Baumaux. Web site. ''Flageolet" Victory Seeds , eSeeds. 'Flagrano' Johnny's Selected Seeds. Web site. 'Flambeau' Terra Edibles. Web site. "Hâtif " Awaiting feedback (not sure if green-seeded). "Nain de Touraine" Awaiting feedback (not sure if green-seeded). "Triomphe des Châssis" Awaiting feedback (not sure if green-seeded). Clause & Tézier are not likely to carry flageolet anymore. They are now connected with Limagrain, a group contemplating a future of G.M.O. (genetic engineering). It seems that Vilmorin is still retaining a small branch out of those groups, but for how long ? Truffaut appear to have dropped their seed retailing branch. There is a climbing variety of flageolet after all. Its official name is either 'Flageolet à Rames' or 'Soisson vert à Rames'. The botanical names according to our (MMPND) nomenclature would be : Phaseolus vulgaris L. (Vulgaris Group) 'Flageolet à Rames' or Phaseolus vulgaris L. (Vulgaris Group) 'Soisson Vert à Rames'. Of course this bean has been around for a long time but I have just had confirmation that it is available to a few privileged growers in France. It is in the public domain and perhaps this is why the growers try to keep it out of reach of multinational companies. Graines Baumaux sell the pole Flageolet (climbing Flageolet) bean under "Flageolet vert à rames" listed as "HARICOT à RAMES à ECOSSER SOISSONS VERT"
Meanwhile Diggers seeds (Aust.) have introduced the cultivar 'Flagrano' into Australia. Airola P. 1984 How to Get Well, Health Plus. Aubert C. 1973, Le Jardin Potager Biologique. Le Courrier du Livre Paris. Ball Jeff, 1988, Garden Problem Solver, Rodale, U.S.A.
Beatty V. 1983. Orientals Herbs & Vegetables. Vol. 39, No. 2. Brooklyn Botanic Gardens. Bérard L., Froc J., Hyman M., Marchenay P., 1993. Fiche Haricot Chevrier in Inventaire du Patrimoine Culinaire de la France. Ile-de-France, Paris, Albin Michel. Bois D. Prof. 1927, Encyclopédie Biologique, Vol 1, Les Plantes Alimentaires, Ed. Paul Lechevalier, Paris. Bubel N. 1978, The Seed-Starter's Handbook, Rodale Press. Catros- Gerand Seed Co. 1 Avenue de la Gardette 33560 CARBON BLANC - France. Catalogue 1985. Chicheley Plowden C. 1972, A Manual of Plant Names. G.Allen & Unwin Ltd. London. Food & Agricultural Organisation. United Nations. 1978, Agricultural and Horticultural Seeds. Harrington J.F. 1954, Tables & Extension Leaflets, Dept. of Veg. Crops, Uni. of California, quoted in Bubel N.
Hessayon D.G. Dr. 1985, The Vegetable Expert, pbi Publications, England. Hill L.D. 1979. Grow your own Fruit & Vegetables. Faber & Faber London. Houghton Mifflin Co. 1987, Taylor's Guide to Vegetables & Herbs, Chanticleer Press Edition. INRA , 2000 - 2002 , Base Haricot. Institut National de la Recherche Agronomique. < http://www.inra.fr/Internet/Produits/legumineuses/haricot/haricot.htm >. Kadans J.S. Dr. 1973, Encyclopedia of Fruits, Vegetables, Nuts and Seeds... Parker Publishing Co. Inc. N.Y.
Knott J.E. 1955, Vegetable Growing, Lea and Febiger, Philadelphia, PA, U.S.A..
Knott J.E. 1962, Hanbook for Vegetable Growers, John Wiley & Sons, New York. Morschel J.R. 1975, Plant Diseases Recorded in Australia & Overseas, Aust. Gov. Publishing Service, Canberra. Peace Seeds Co. U.S.A. Catalogue 1989. Porcher M. 1989, A preliminary Multilingual Checklist of Vegetable Names. Unpublished. Porcher M. 1998, MULTILINGUAL MULTISCRIPT PLANT NAME DATABASE, "http://zygote.agfor.unimelb.edu.au:8008/Porcher/Plantnames/Frontpage.html", Landcare Systems Research Laboratory, The Institute of Land and Food Resources, The University of Melbourne, Australia. Porcher M. H. et al, 1995 - 2000, MULTILINGUAL MULTISCRIPT PLANT NAME DATABASE, Landcare Systems Research Laboratory, Crop Production, The Institute of Land and Food Resources, The University of Melbourne, Australia. < http://gmr.landfood.unimelb.edu.au/Plantnames/ >. Porcher Michel H. et al. 1995 - 2020, Sorting Plant Names. Multilingual Multiscript Plant Name Database (M.M.P.N.D) - A Work in Progress. School of Agriculture and Food Systems. Faculty of Land & Food Resources. The University of Melbourne. Australia. Renaud V. 1988, Le Potager par les Méthodes Naturelles, Christian Dudouet , France. Tanaka T. Dr. 1976, Tanaka's Cyclopedia of Edible Plants of the World. Keigaku Publishing Co. Tokyo. Japan. Thomas S. & Corden M. 1985, Metric tables of Composition of Aust. Foods, Com. Dept. of Health, Canberra. Thorez J. P. 1985, Le Petit Guide du Jardinage Biologique, Terre Vivante, Paris. Vermont Bean Seed Co. U.S.A. Catalogue 1987. Abondance, Genest S.A. B.P. 37, 38290 La Verpillière, France. Catros-Gerand, B.P. 23, 33560 Cardon-Blanc, France. Hastings, P.O. Box 115535, Atlanta, GA 30310, U.S.A.
Herb Gathering Inc. 5742 Kenwood, Kansas City, MO 64110, U.S.A.
High Altitude Gardens, P.O. Box 4238, Ketchum, ID 83340, U.S.A. Le Jardin du Gourmet, West Danville, VT 05873, U.S.A. Le Marché Seeds International, P.O. Box 190, Dixon, CA 95620, U.S.A.
Nichols Garden Nursery, 1190 N. Pacific Hwy. Albany, OR 97321, U.S.A.
Royal Sluis, Postbox 22 - 1600 AA Enkhuizen, Holland. Seed Savers' Network Australia, P.O. Box 24, Nimbin, N.S.W. 2480. Tézier, B.P. 223, 26008 Valence Cedex, France. The Cook's Garden, Box 65, Londonderry, VT 05148, U.S.A.
Truffaut, 21 rue des Pépinières "Les Noëls", B.P.9, 41350 Vineuil, France. 1. This is not well enough researched on my part but mostly logically deducted. Feedback appreciated. 2. Please note that these lists were drawn more than 10 years ago so I would appreciate feedback from or about these companies and of course on flageolet in general. Thanks. 3. Seed Savers Exchange , created 1975, 3076 North Winn Road, Decorah, Iowa 52101 USA. 4. The Seed Savers Network (established 1986) has encouraged the creation of other non-governmental groups with similar interest since this article was published. Heritage Seed Curators Australia Inc. (formed in 1992) is one of them - no longer active, partly resurrected under Seed Savers @ CERES. 5. The most consistent supplier of large (commercial) quantities is Sunland Seeds (P. O. Box 7, Milperra NSW 2214, Tel : 1 800 224 428 ) strictly for wholesale supply or importation. The most consistent suppliers of small quantities for gardeners are SSN & HSCA above (4). It would appear that in Australia no retailer has persisted more than one or two years with the supply of any cultivar of flageolet to gardeners.